The U14s faced a very strong Cosby team in the Cup semi-final at a sunny Kilsby Lane with the players knowing that this would be a very tough test but also confident in their own ability. 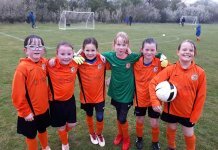 The match was keenly contested but the Rugby Town players had already shown they were prepared to physically dominate the game by the time Charlotte scored from a tight angle mid way through the first half. The game plan called for a lot of energy from the players as well as discipline against very good opponents and the players demonstrated these in abundance. Both teams had chances but the score stayed the same until half time and Rugby Town deserved their lead. Despite the amount of energy expended in the first half the players were ready to do it all again in the 2nd. The team looked a little more in control but against talented opposition there was always going to be a threat. The team sought to defend their lead but also had to pose a threat and they did this and when a 2nd goal of the game came from a run and shot from Molly it was deserved. Whilst the second goal made things a bit more comfortable there was no chance to ease up and the players did not. Cosby got a goal back with about 10 minutes remaining and this obviously gave them belief they could complete a comeback and they pushed for this. The Rugby Town players though dug deep, didn’t panic and worked hard to stifle space and win the ball with committed defending whilst also finding reserves to break quickly. 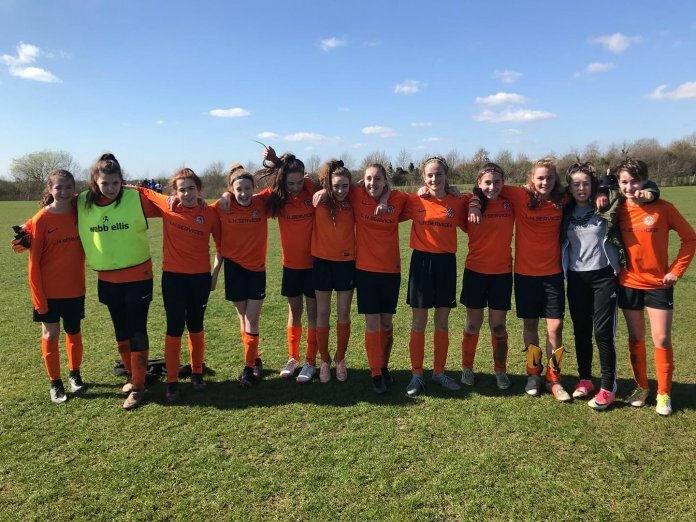 When the final whistle came the players had earned their place in the final with their performance in a great match between excellent teams befitting of the occasion. Jodie made saves in goal, came off her line well when needed and showed excellent distribution. 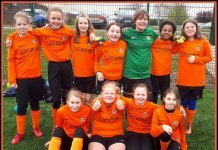 Erin and Ella won many tackles and showed great discipline in defense along with Amber who once again marked opposition players out the match whilst passing the ball well. 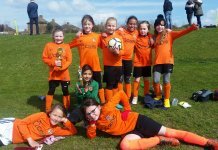 The midfield showed great stamina and intelligence with Charlotte and Savannah working really hard to defend and getting forwards quickly when the opportunities were there out wide and Kayla dropping in to help the defence countless times with interceptions and clearances whilst also breaking forwards dangerously and captain Molly tackling hard and taking the ball forwards to create chances. When changes were made Mims and Josiane both slotted into the midfield picking up the pace of the game and giving it their all to help defend from their wide positions and also get forwards on the counter whilst Charlotte dropped into defence and helped close the game out. Finally Cesca, up front on her own for the whole game with a game plan that meant she had an enormous amount of work to do, often got the ball before the Cosby defenders through anticipation, determination and pace and put pressure on them when she couldn’t.